Since 2000, Harley-Davidson has worked hard to retain its image as an American icon while at the same time reaching out to a new generation of bikers. Today, Harley Davidson is very well known for updating its products according to the need of time. This time, they brought a great mash-up of modern technology with the retro-inspired styling from their existing HD Forty-Eight and named it as Roadster XL1200CX. 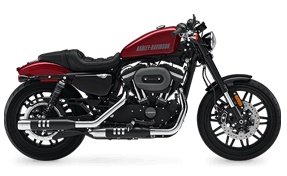 The Roadster is a model from Harley-Davidson's Sportster line of motorcycles. The Harley Davidson Roadster motorcycle combines stoplight-to- stoplight power, agility, and garage-built custom style to shatter every mold. The Roadster comes with the same underbody as the Forty-Eight while most of the visual parts have also been kept the same as the other one. This bike uses the iconic fuel tank design that is painted in a single color for a pure finish while the exhausts of the Roadster are painted in chrome with black panels on both of them. The fenders on the bike have been cut short for a KHR model inspired look on the Roadster. The bike has slammed handlebars that will help the rider to put the body posture in an aggressive way and the new gauge includes a speedometer and tacho, so the rider will have the track of the power plant. The Roadster motorcycle uses a differently placed handlebar while the padded seat provides a more upmarket look to the motorcycle. The motorcycle is available in Velocity Red Sunglow, Bullet Silver, Black Denim and Vivid Black shade while the only difference in its two variants is the use of ABS on the higher one. The 43 mm front suspension with the inverted forks features cartridge damping and brawny look of the massive new triple clamps. It helps the rubber of the tire to keep a smooth ride on rough pavements prowess gets new paint-schemes and graphics that add to its rugged and muscular look. The new Roadster from Harley-Davidson gets the V-Twin 1200cc Evolution air-cooled engine making peak torque of 96Nm at 4000rpm. The motorcycle comes with dual floating, 300 mm disc brakes at the front while the rear is a single disc measuring 260 mm. ABS has been given as an option on the new Roadster. The front suspension has been changed from the traditional telescopic forks on other bikes to a new 43 mm USD forks with 115 mm of wheel travel. The rear uses twin gas charged shocks with 81 mm of travel. The bike rides on 120/70-19 and 150/70-18 Dunlop Harley Davidson series tires. Placed above Forty- Eight in the line-up, the Sportster comes with a 4-inch digital instrumentation which displays RPMs, speed and time. Besides, it also gets a trip meter, gear indicator, and tell-tale lights to enhance the interior. Harley Davidson Roadster offers an extremely comfortable ride with the great suspension which is good for long journeys. The Roadster has a number of design cues that hint at its orientation towards performance - the 'bars are dropped, the seat has a bumstop, the front forks are inverted, there's a twin disc setup for the front brakes. It has Good throttle response. Though it has a tough new look, Roadster is light and agile which is loved by the riders. We all dream riding Harley Davidson someday and if you are successful in making your dream a reality, you are the lucky one. Harley Davidson not only offers joy to the rider, but it offers a pride and thrill that makes you proud and excited about owning a Harley Davidson. Comprehensive insurance is the ones that cover against all types of wear and tears to the Harley Davidson across its dealers. Optional Coverage such as personal accident covers for the rider, Zero Dep cover and etc. One need to pay the extra cost for the optional coverage. Genuine Repair of the bike is assured with the genuine accessories and parts of Harley Davidson. Harley Davidson Roadster prices start at Rs. 9.85 lakh (Ex-Showroom). Harley Davidson Roadster is available in 1 variant and 4 colors.